What Is Fabric Grain and Why Is it Important to Quilters? The term fabric grain refers to the way threads are arranged in a piece of fabric. Grain is one of those quilting topics that you might not think is important, but the way we cut fabric in relation to its grain can produce quilt blocks that are accurate and easy to assemble — or blocks that just won't do what you want them to do. Fabric's Warp Threads: Long threads, called warp threads, are stretched on the loom and secured. They become the fabric's lengthwise grain, the threads that are continuous along the length of the yardage. Weft Threads: More threads, called weft threads, are woven back and forth, perpendicular to the warp threads and along the entire length of the warp threads. Weft threads make up the fabric's crosswise grain. Straight Grain Edges: The lengthwise grain and crosswise grain are both regarded as straight grain, sometimes called straight-of-grain. Fabric Bias: True bias is defined as the direction at a 45-degree angle to the straight grains. Quilters refer to any cut that doesn't run along a straight grain as a bias cut. Fabrics that are cut with edges parallel to either the crosswise or lengthwise straight grain are less likely to stretch out of shape than pieces with edges cut along the stretchy bias. The interwoven straight grain threads provide extra support. There are more warp threads per square inch than there are weft threads per square inch. The extra density adds strength. Since they do not stretch easily, long strips of fabric cut on the lengthwise grain make good quilt borders and sashing. They can stabilize and help you square-up the outer edges of blocks or quilt tops. Sashing strips with long edges cut along the lengthwise grain add stability to blocks. Long strips of fabric cut from selvage to selvage, along the crosswise grain of the fabric, have many uses in quilting. Two popular examples: we use the strips for strip piecing and we use the long strips as a starting point to cut patchwork shapes for quilts. 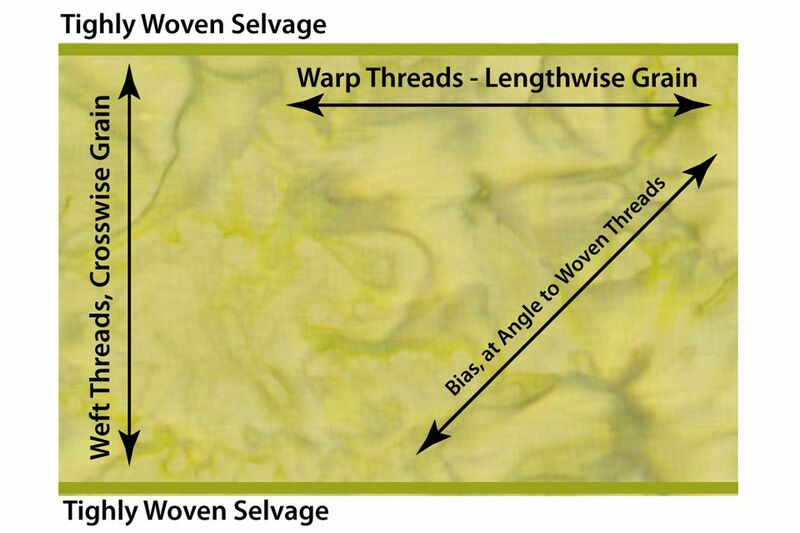 Selvages are the bound edges that run along the outer edges of the lengthwise grain. They are formed when the weft threads turn to change direction as the weaving process travels down the warp. Fabrics are very tightly woven for a half-inch or so from the selvages inward, keeping the edges stable while the fabric is on the bolt. There are no threads to stabilize fabric along the bias, so cuts with edges that run along the bias are quite stretchy. Long, stretchy strips cut along the bias are easy to wind around the curved edges of a quilt when adding the binding. Thin tubes made from bias cut strips can be used to create delicate shapes for applique. Bias cuts can often be turned under easier for some curved and slanted applique shapes, including hearts. Bias edges placed along the outer edges of quilt blocks or other patchwork components can stretch out of shape as you handle the quilt during construction, making it difficult to match and sew pieces together accurately. Triangles always have at least one bias edge. Analyze the pattern to determine the best placement for it -- usually on a block's interior and sewn to a straight grain piece when possible for stabilization. There will be times when you decide to cut a patch with bias edges in the "wrong" position in order to use a specific part of a print or to make it flow with its neighbors. The cat fabric in the photo is one example of fussy cutting that resulted in outer edges that are slightly off the straight grains. Occasional wayward patches are fine, but remember where the stretchy bias edges are and handle them with care. Tug on the fabric side to side, along one straight grain, then tug from the other direction. Tug on the square from corner to corner -- along the bias. It probably stretched quite a bit, and if you tugged too hard it may have become permanently distorted. Experiment with fabric grain. It won't be long until you understand the best ways to place grain in your quilts to achieve the results you're looking for.